A general election candidate who upset German tourists by shouting "who won the war?" at them has been fined £250. 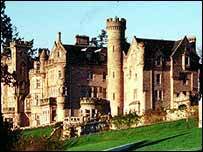 During the outburst at Skibo Castle, Gordon Campbell, 68, also claimed he would "sort out Bush and Blair". Campbell, an independent candidate who described himself as the Caithness Capercaillie, denied being anti-German and denied being at Skibo that day. However, at Dornoch Sheriff Court he was found guilty of causing a breach of the peace. The court heard how he began shouting and swearing at four Germans when he heard them speaking at the Highland retreat in April. He also told English and American guests he was going to get rid of George Bush and Tony Blair. Members and staff were stunned and he was asked to leave. Campbell told the court he had worked in Stuttgart for 35 years. After receiving his sentence he vowed to appeal, claiming that, as a result of the case, his reputation had been "shattered, battered and tattered".